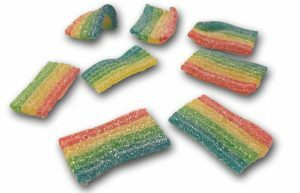 I saw these little darlings in a local grocer-meets-deli that always has Haribo flavors the rest of America doesn’t get. Either the owner is buying online and reselling or he’s got a super big ‘in’ with the Germans. 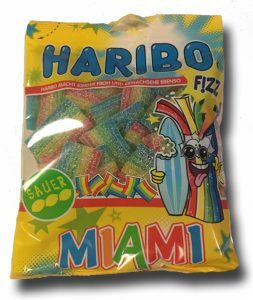 These Haribo Miami sour candies are a lot like other haribo sour things, most like pulled apart Sour Sghetti. They recall the Fruity Pasta recipe too, though those are thicker and tougher (and let’s be honest, better). These babies are still unique. For one, these are softer than other sour Haribo… Maybe if I fridged them they’d be harder… The flavor is actually multiple flavors in one piece. See the color scheme? I give these a solid B+. The lemon sugar isn’t too sour, the flavors make you want to eat more, and they’re made in Miamiº. ªThey’re not made in Miami.